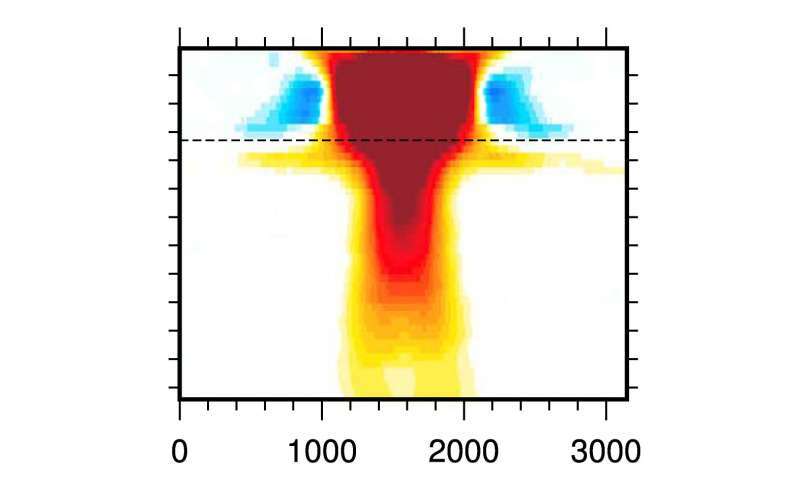 "It is a big computational challenge to simulate wave propagation through mantle plumes," Maguire said. They needed numerical codes that solve the elastic wave equation in Earth's mantle at high frequencies and in three dimensions. "What that does is it allows us to accurately account for the effects of wave propagation phenomena such as wave diffraction around plume tails, which is very important for imaging plumes," Maguire said. Dynamic simulations of plumes used in sensitivity tests. The plumes are symmetric about the vertical axis at x = 0. For each plume, the excess temperature is shown on the left and the reduction in shear velocity δVS relative to the Preliminary Reference Earth Model is shown on the right. The plume structures R1a, R1b, and R1c are snapshots of the same dynamic simulation at 45 Myr, 55 Myr, and 175 Myr, respectively. Credit: Maguire et al. Supercomputers might finally be starting to catch up with long-standing scientific questions and help provoke new questions. "I think that the challenge remains in understanding exactly what we are looking for," said Ritsema. "In Maguire's work, we have defined a mantle plume as a purely thermal upwelling in the deep Earth. In this particular case, the plume is a fairly narrow structure—it has a fairly narrow tail, with its complications in imaging. But there has been other work by other groups who have in fact argued that plumes might be much thicker than what we have investigated in our work. 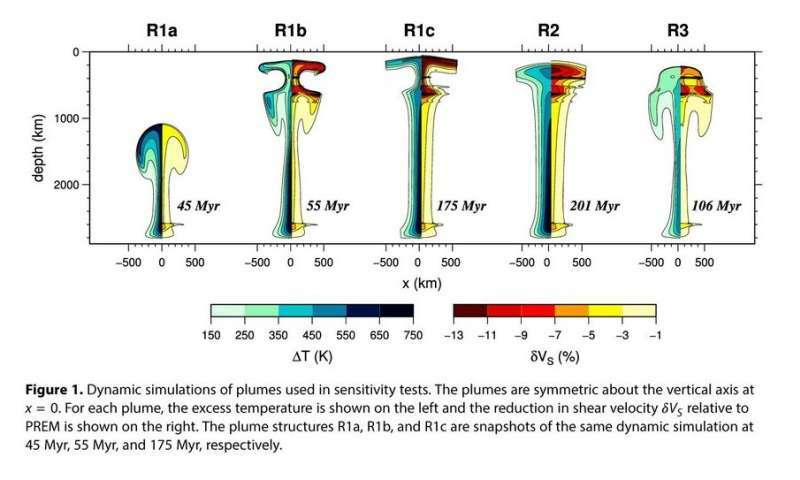 The very nature of plumes, whether plumes are purely thermal or temperature-driven, or whether there is also a compositional component to their formation, are issues that are now being addressed in geophysics," Ritsema said. The study, "Evaluating the Resolution of Deep Mantle Plumes in Teleseismic Traveltime Tomography," was published in January of 2018 in the American Geophysical Union's Journal of Geophysical Research: Solid Earth.